Upper: Elasticated, two-piece knitted mesh. Midsole: Injection molded EVA variant, 6 mm heel to toe drop. The Flyknit experience without the extremely compressive fit of 2013 Free Flyknit and Free 3.0 Flyknit. Perhaps the best expression of the Free design ever. Only if it was better finished. Some colorist sitting deep within the Nike HQ deserves a pat on her/his back. Gotta love this colorway of the new Free 4.0 Flyknit. Looks pretty rad – a fiery melange of red, orange topped with black, it doesn’t get any better than this. And what an evolution has it been for the Nike Free line-up. The shift started with release of the original Nike Free Flyknit in August 2013, followed by the brand new Free line-up earlier this year. Do you want a primer? We’ll break it down for you just in case, with our much used reference chart below. The suffixed numbers on the Free scale represent minimalism levels in each of Nike Free products. The Free 3.0 is the minimal-est shoe of the lot, followed by 4.0 and finally the 5.0, which is middle ground and most popular of the lot. There is also a Free 1.0 in Nike Women’s training, but that does not count. The Nike 4.0 finally comes of age. In pre-Flyknit era, the Nike Free 4.0 used to be this neglected step-child of sorts. Wedged between the ultra-minimal 3.0 and mainstream 5.0, it often had difficulty differentiating itself from its odd numbered neighbors. It did not seem minimal enough to appeal to many low-drop yearning runners, and traditional shod runners didn’t know what to make of it. Thankfully, a ball of yarn turned out to be its saviour, effectively changing its place in Nike’s minimalist-offering hierarchy. How so? We’ll explain. Let’s take the Free 3.0 Flyknit to begin with. It features a tight, compression fit near identical to the original Nike Free Flyknit, with the difference being use of a minimal, more flexible outsole worthy of 3.0 lineage. The regular Free 5.0 is a more relaxed shoe, packed with Flyknit inspired aesthetics without actually featuring one. Noteworthy mention is that both Free 3.0 Flyknit and 2013 Free Flyknit feature a sock like upper without a conventional tongue or lacing system. The heel on both these models have aggressive compression with a vice-like fit. 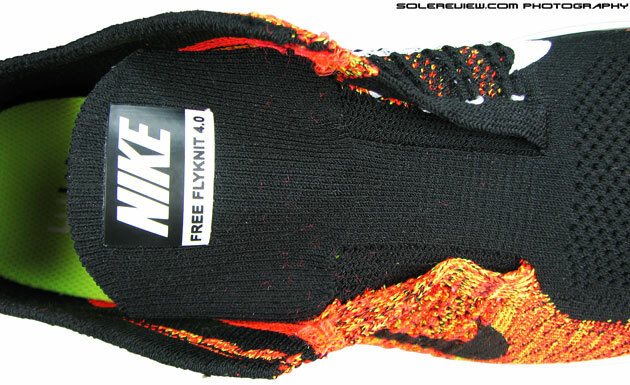 The 4.0 upper lacks extreme compression of the 2013 Free Flyknit so midsole curling is contained. So what about runners, who crave the Free Flyknit fit, but wanted something a bit more relaxed, resembling a traditional shoe? This is where the Free 4.0 Flyknit comes in. It’s got a Flyknit upper, but nowhere as tight as other models. It has a got a traditional tongue, gusseted to the upper with proper lacing and all that. The collar area is snug, but not corset tight. 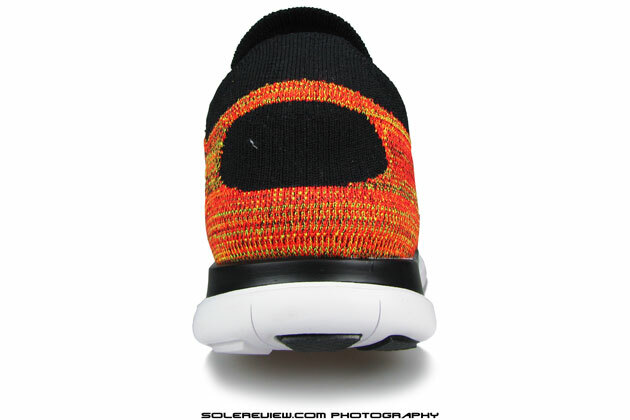 And because of the tongue, the upper goes easy on pressure, making Free 4.0 Flyknit a comfortable, daily use shoe. And by chance or design, Nike might have created the truest expression of its Nike Free platform yet. The premise of Free concept was based on delivering a ’natural motion’ experience, with elements like ‘less shoe’ and more ‘feedback’ being enablers towards that goal. Two piece knit upper joined by a rear-foot seam. Upper of the Free 4.0 Flyknit is built using the same construction fundamentals as other shoes in the yarn-spun product line. The upper is a two piece, knit panel type, with variations in knit patterns producing different stretch behaviors. The forefoot sides have dense knitting for structural support, while top of toe box has a generously perforated pattern meant for easier stretch and ventilation. Forefoot snugness feels similar to the 2013 Flyknit experience, securely locking down the front. There is some space ahead though, a near-half size gap between the toenails and tip of the shoe. This, we believe has something to do with the near-squareness of toe – likely a design pre-requisite for the unique Flyknit construction. Our speculation is that an upper with a pointy toe could lead to wrinkles in the upper and put more curling pressure on the outsole – because of concentrated elasticity. 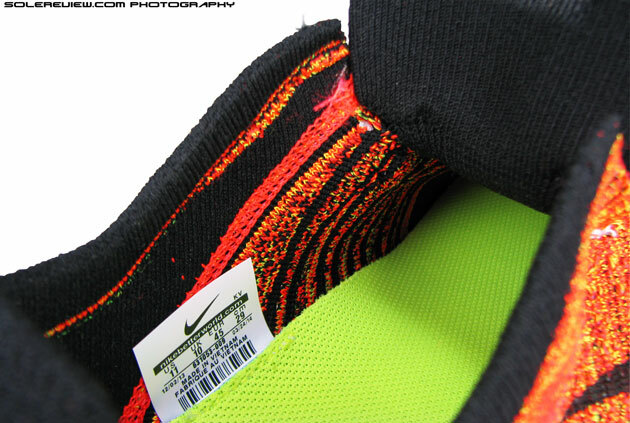 So if you own a pair of 2013 Free Flyknit, you’ll notice that the 4.0 Flyknit runs 2/3rd of a size larger. Strong threads travel upward through mid-foot tunnels and form lace-loops. Tongue design is similar to the Flyknit Lunar 2. It is gusseted (attached) from halfway down. The mid-foot design shares aesthetics and construction basics with the 2014 Flyknit Lunar 2. Flywire threads weave their way upwards from the upper base, ensconced in small ’tunnels’ woven into the mid-foot panel. The eye-stay is a separate flap, and tongue is knit-integrated into the upper from half-way down, giving enough freedom for the top half to move around. Naturally, the fit ends up being a mix of the no-holds barred Free Flyknit and more relaxed Flyknit Lunar 2. Which is actually a good thing. There is determined snugness in the fore and mid-foot, but without the choke-hold grip of 2013 Free Flyknit’s tight collar and tongue area. The ‘Flywire’ cord execution is always buggy. Some of the loops are visible, while others are too short and disappear. Mid-foot pressure is far more relaxed than 2013 Free Flyknit or 3.0 Flyknit. Flywire cord lacing isn’t perfect though, as seen in other instances. Some loops are shorter while others are long, leading to an unevenness in cinching. Mercifully, the Flyknit upper has decent levels of stretch built-in, so the drawback of Flywire becomes a lesser factor in bigger scheme of things. The top-down pressure on the 4.0 is is less terrifying compared to Free Flyknit. An asymmetrical lacing system and a narrow gap between opposing eyelets help ease off pressure. We light up the Black-Crimson Free 4.0 colorway. You should try this at home. How does the 4.0 Flyknit perform on ventilation? 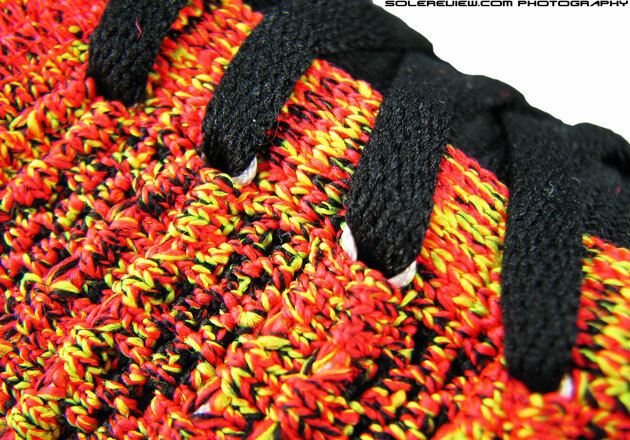 Pores are knitted into the mid-foot panel, but the crazy colorway makes it hard to see. Fret not, we know of a perfect way to show you. Simply put a small camping light inside the shoe, and hit the on switch. Lo and behold, the eerie glow makes it easier to see where the ‘cool’ zones are. We tried this technique in our 2013 Flyknit Lunar 1 review, so thought why not try it on the Free 4.0 too? 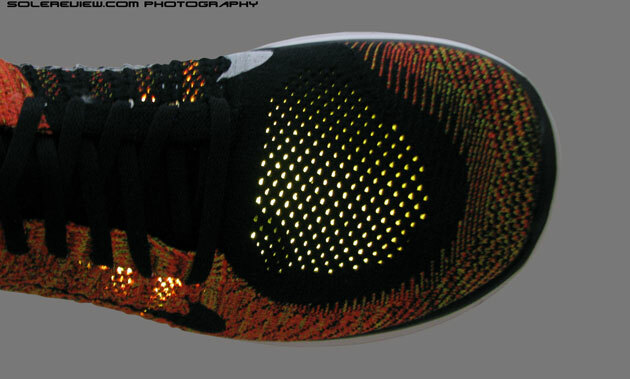 The result didn’t disappoint, with the Flyknit lighting up like a shoe-shaped Chinese paper lantern. 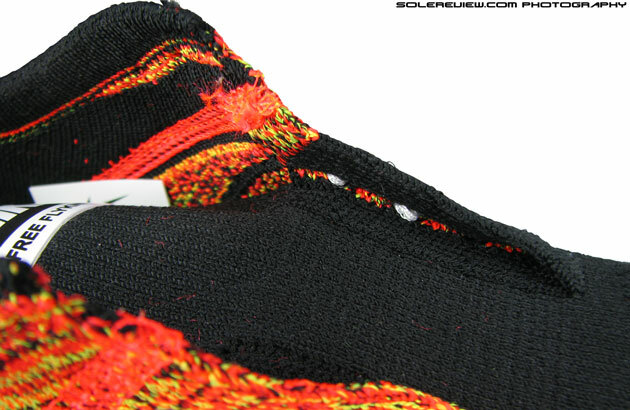 Two flat zig-zag seams keep two pieces of the Flyknit upper together. Collar area is made of an elastic band going around your ankles. Feels like a pair of socks. The black, oval window is more elastic than rest of the rear-foot. Cups the curve of the heel bone. Rear-foot is separated from rest of the upper by two zig-zag side seams. The construction itself is a simple affair. Most of that area has a dense, fibrous knit, with exceptions being the elastic oval window cupping the curve of heel bone, and the collar. The stretchy window wraps the heel without discomfort, and the elastic collar is a flat, unpadded band which goes around the ankles. Like the rest of Free 4.0 Flyknit upper, the experience is far less intense than Free 3.0 or the Free Flyknit. The grip comes across as a no-nonsense feeling of lock-down; consequently there’s no foot slip during runs. Yes, you can go sock-less in these. Tongue lip is slightly long and touches the curve (instep) of your foot. 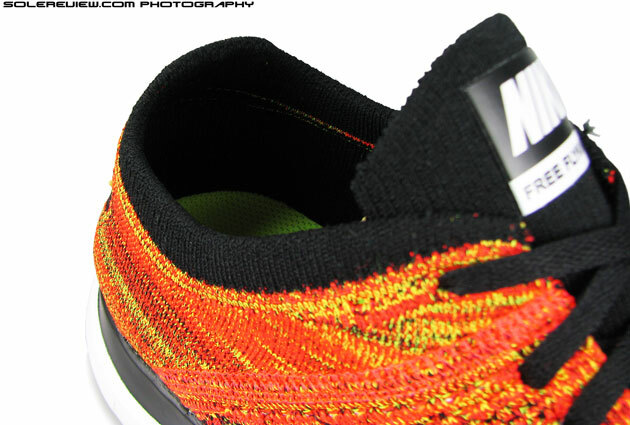 Like other Free Flyknits models, you can go sock-less in these shoes. The upper feels seamless from the inside (because it is almost so), and no unruly bits rub against the skin. There’s a minor glitch, though. Without socks, the tip of the slightly long tongue tends to ride up against the curve of the foot. It doesn’t irritate or chafe, but you are likely to feel that. 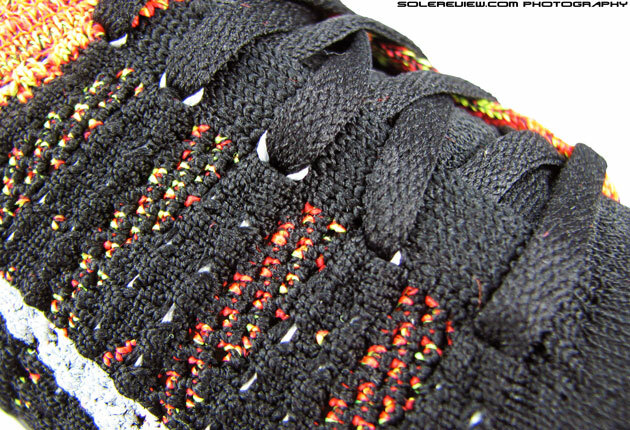 Same Sockliner as the one used in last year’s Free Flyknit. Lift the removable foot-bed, and an EVA strobel layer reveals itself. 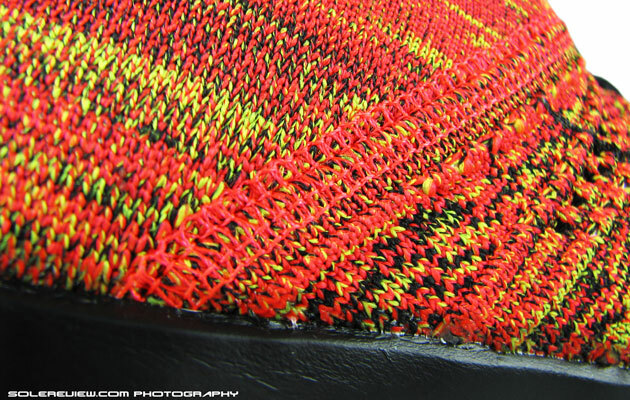 The foot-bed is identical to the one used in 2013 Free Flyknit. Thin layer of Ortholite branded foam which feels part memory-foam, part regular EVA (Ethylene Vinyl Acetate). The sizing label is cleverly attached to its sides (which you can tuck under, by the way) and the top-cloth is smooth and grips well. 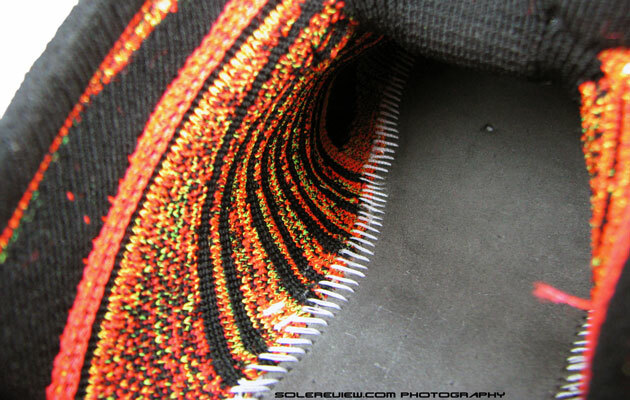 The 2013 Flyknit had this peculiar problem; after running bare-foot the sockliner would stick to the undersole of forefoot and become displaced while taking the shoe off. This was due to extreme upper lock-down, and caused the foot-bed to glue to the foot. The more relaxed nature of the Free 4.0 prevents that from happening. Brand new Free outsole design is much better than earlier versions. Hexagonal pod layout leads to better transition and cushioning. Look below the upper, and the sole is largely made of one material. Injected molded EVA forms majority of the midsole, and tiny rubber pieces are placed in high wear areas. The design is transformed from that of rectangular criss-cross flex grooves in earlier Free versions to a hexagonal array of foam pieces – each parted into individual columns by a network of deep, thin siping. The transition is much smoother than previous Free outsole design because of this change. Cushioning comes from both midsole compression and the ‘piston’ like effect of lugs pressing down inwards. The 4.0 Flyknit is much more cushioned than most minimal shoes due to its choice of sole material. Rubber is sparingly used – under the heel and toe area only. 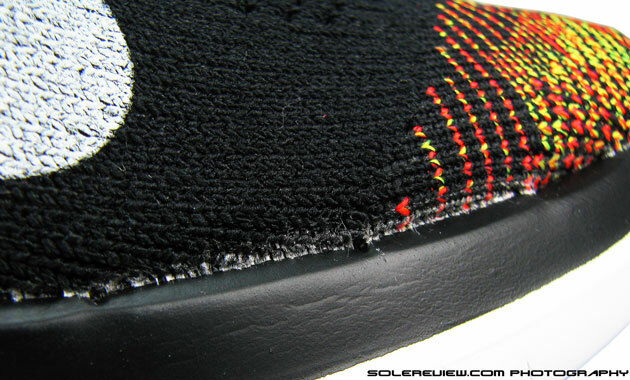 But the rest of outsole should be durable too, going by our experience. For a near full-foam midsole, traction comes pretty good for what it is. It helps that the outsole is soft, which helps improve its grip on multiple paved and synthetic surfaces. Of course, it will be unfair to compare it with fully rubber clad running shoes where the latter will score higher both in grip and durability. Based on our long term ownership experience of other Nike Free shoes, the 4.0 should last at least 250 miles before you start seeing significant wear and tear on the outsole. Durability is always subjective, so we’ve quoted what we believe is a bare-minimum threshold. Since there’s a lot of deep grooving, plonking miles on unpaved surfaces is best avoided on all shoes from the Free line-up. Unless, you enjoy fishing out small pebbles and departed insects from Free 4.0’s outsole. The world is a strange place, so it wouldn’t surprise us if some people derive pleasure from doing that. It could be like one of life’s deeper, unexplained mysteries, like a craving addiction for popping bubble-wrap sheets. There, we got you. Also worth noting is that first use of this ultra-flexible, 6 mm heel-drop shoe might potentially lead to some initial aches and soreness in muscles. With that in mind, it will do good to ease into these shoes gradually and not put many miles during the first few runs. And if you’re already firing all cylinders on an older pair of Nike Free, then transition should be seamless, only a better one. The top line represents retail pricing of different shoe models, and the line below shows FOB costs (‘Freight on board’ or ‘Free on board’ ). Look at the Vomero 9, Lunareclipse 4 and Free 4.0 costs – it is pretty much a flat line, though the retail prices aren’t. It is clear that the minimal Flyknit does cost more to make than higher priced Nike shoes, its minimal construction notwithstanding. 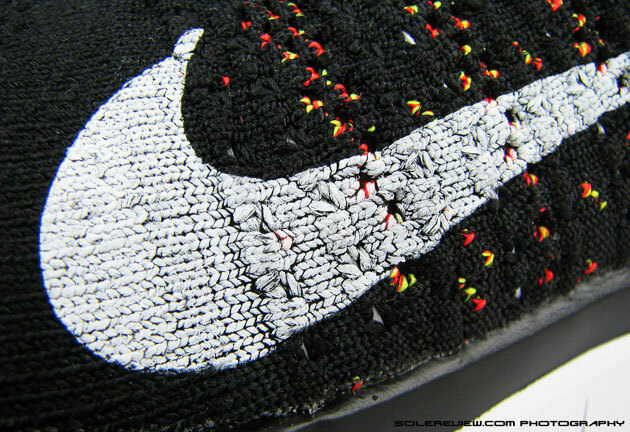 It seems that what Flyknit saves in material, it loses in time. And in industrial manufacturing, time is money. But like any other industrial product, scale and manufacturing productivity should lower the cost of future Flyknit shoes. 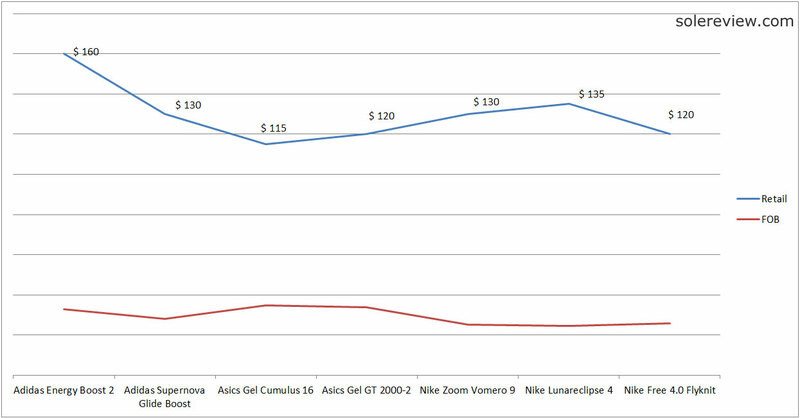 However, this brief examples makes it obvious that Nike is more efficient at keeping costs down compared to brands like Asics and Adidas. Look at the $130 Lunareclipse 4 cost, it is lower than the $115 Asics Gel Cumulus and the equally priced Supernova Glide Boost. 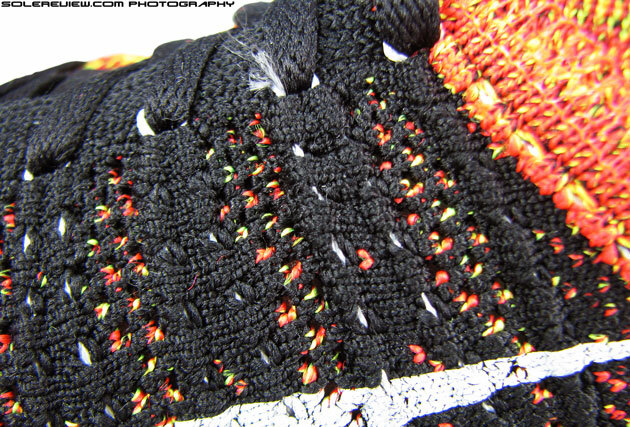 We can easily sum up the Free 4.0 Flyknit by saying it is perhaps the best expression of the Nike Free platform so far. It has an upper which feels natural, resulting from use of minimalist construction principles, fit and selection of upper materials. Its lightweight outsole bends with an effort barely felt, allowing the foot to flex without much coming in its way. So shall we quickly give it a crown of perfection, shower it with confetti and make it the highest rated shoe on solereview? The adage, ‘to err on side of caution’ is taken to heart here. There are a couple of not-so-good things about the Free 4.0 Flyknit. Although neither of them have any bearing on the ride experience, they are blemishes nevertheless. We’d like to point out that Nike shoes tested recently were tardily glued together, with dollops of shoe adhesive visible around the upper edge. It is very prominent in black colored uppers, which tends to contrast with the glue. There is a certain unspoken allowance for adhesive showing up on the upper, but we’re sorry to say that here the glue marks cross that line. The inner (medial) swoosh is a tacky, screen printed gob of ink. Black does much better, though. The screen printed swoosh also looks tacky, especially in white. The Flyknit is an innovative concept which incidentally costs a lot to make. So why should the Swoosh be applied using archaic screen printing? They could easy take inspiration from their Nike Apparel division, which puts logos on fabrics much stretchier than the Flyknit upper. Picture an image of a beautiful, four storied Parisian apartment building. Perfect structure, lovely pastel ochre shades and magnificent balustrades and awnings on each apartment. Except that one window has a solitary piece of laundry left to dry. It could be a pair of wet socks, but does enough damage to effectively deflate your vision of architectural perfection. The picture of the light through the shoe is a really cool shot. 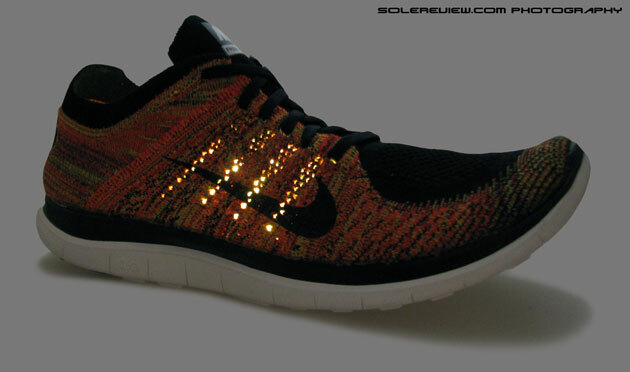 So basically these are a much better version of the original Free Flyknit, which I own. But I am right there with you in that they were way overpriced at $160, $120 is a much better pricepoint for these shoes. Its very telling that the first one actually went off Nike’s site sooner than normal for a launch shoe and I bought my pair at an outlet for $40. Will definitely have to try these. I am hoping for the cost of Flyknit shoes in general to go down as this the cheapest Flyknit shoe Nike has released and its still over the $100 pricepoint, while I really love this technology. Our sense is that the Flyknit will always be an expensive shoe priced north of $100. If you look at our pricing vs. costs graph, the Free Flyknit still has some way to go before it comes in line with the ‘expected’ gap between pricing and cost of manufacturing. So even with improvement in costs, it is likely to stay at $120 levels. The smart thing to do is what you have done – wait for prices of older colorways to drop, and then snag them much cheaper. The adidas adios Boost 2 or Boston 5 Boost, or Nike Air Zoom Streak 5. Try something like the adidas Adios Boost 2 or Nike Zoom Streak 5 for raceday. Hi, how is the fit of these shoes? I am thinking of getting it in the size US 8.5 after having tried on a 3.0 V5 in the same size (with 0.5-1 cm of room left) that provided a good fit. What size would you recommend that leaves something around 0.5-1 cm wiggle room if I have a 26 cm foot length with socks on? b) Is the biggest toe the further-most part of your foot? There are many instances of the big and second toe being the same length. Or of your 2nd toe is longer than the big toe, please specify the difference. Thanks for replying, my foot was self measured, my big and second toe are the same length and thin-medium thick socks were used. a) Fit is snug around mid to rear-foot, with noticeable wiggle room in the forefoot. 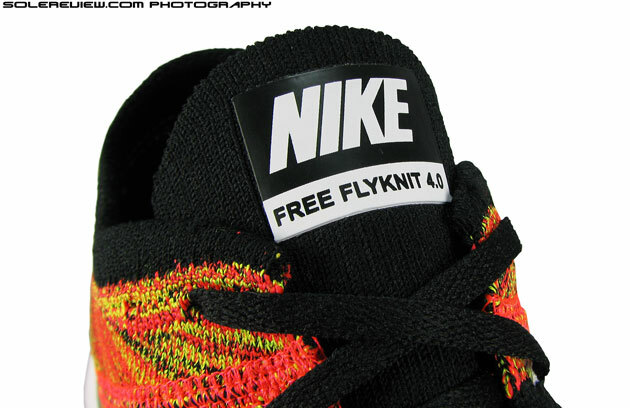 b) The Free 4.0 Flyknit toe box differs from 3.0 V5 in couple of ways. First, there is more room sideways outside of the toe. (area closest to the other foot). Secondly, it has half a size of more space ahead of the toes compared to Free 3.0. Technically speaking, sizing of Free 3.0 V5 and Free 4.0 Flyknit is the same. The difference lies in 4.0’s elastic heel cup, which allows the heel bone to move backwards when compared to the 3.0. This adjustment results in the size difference and potential need for downsizing. c) So for a US 8.5 sized Free 3.0 V5, US 8 on the Free 4.0 Flyknit should do it. That said, please fit test the shoes personally to gauge your own assessment of fit – and overlay that over our opinion. Thank you so much! Greatly appreciated for your suggestion. You’re welcome, and thank you for reading our reviews! Forgot to add that it was measured through tracing, measuring and averaging the results according to how Nike suggested on their website. Which one is the best for long distance Nike Free 4.0 Flyknit or Nike Air Pegasus 31 ? can I ask for request for Nike flyknit racer and lunarspider? and what which one is the best for 5k road race? I think many runner love that shoes. Hi – thank you for the suggestion, we’ll try and see if we can accommodate those reviews sometime in the future. The Lunarspider R4 is better for a 5k race compared to FL Racer. I recently completed my second marathon wearing these and I thought they were amazing. I had zero blisters and no major aches or pains the next day. I usually wear them with socks for hygiene purposes more than anything else. They are my go-to shoe for most runs and have held up well over their first 250kms. I went true to size when I bought them and appreciated the extra toe wiggle room as I’ve found most Nikes to have narrow toe boxes. I wouldn’t consider myself to have particularly gifted running form and I’d recommend them to anyone looking for a fast, flexible all-rounder. For reference I’m a 82kg, 185cm runner. Thank you for sharing your experience and feedback! Really nice review you got there! Are you also going to review perhaps the new adidas adizero Prime Boost? Thanks! Yes, we have that shoe on our radar, so we’ll probably review it sooner than later. The white part is. The small black outsole pods are marking. I know this is an older review, but it has me interested in this shoe. My question is how much soreness can I expect from the switch from traditional running shoes, and how long would the adjustment period be? For some background, I’ve been running a moderate amount up until recently when I’ve been running daily. My distance usually is about 5 miles max (maybe longer but only occasionally), trying to improve my times on a 1.5 mile run. I currently have some Asics cumulus 13 but find them much too soft/squishy while running. Although, I’ve thought about using them for longer distances (for me 3+ miles) while transitioning to minimalist shoes. Any recommendations? The Free Flyknit 4.0 has a healthy heel drop+padding, so if you’ve been running regularly, it should not load the calves and Achilles much, maybe not at all. Flexibility is where the Free is really different, so there could be some temporary underfoot soreness, expected to last a day or two. But again, that depends on your physical conditioning – if you usually stretch your PF along with your runs, there could be no soreness at all. Thanks for the quick reply, and excellent reviews all across the site. I do have some follow up questions. Would the Free Flyknit 4.0 be OK for taking on hard-packed trails/dirt roads and possibly running on football fields? I’m fine with having to pick out small rocks, etc occasionally from the grooves, but don’t want the durability to be an issue. And would they hold up in wet weather conditions on the surfaces listed above and road running? Do you think the Saucony Kinvara 5 or Brooks PureCadence 3 (you haven’t done a review on it but thought you might have some knowledge of it) might be better options for me given the information provided? Are there other shoes in the same general category that I should take a look at? Ok for running on dry hard packed trails and football fields. However, avoid wearing the Free on wet/damp trails and other natural surfaces at all costs. Wet dirt tends to stick to the foam outsole surface and will make it slippery. You could consider the slimmer Pure Cadence, but you can also look at the Saucony Kinvara TR 2, which is a soft roader. On the other hand, you have something like the Saucony Peregrine, which has a relatively minimal upper but with a full trail function outsole with a stiff forefoot. Thanks for the info. Headed to try some shoes on soon, I’ll add those ones to the list. I appreciate the help. Have been having major calf pain while running. Is it the shoes or just me? How long have you had the pain? 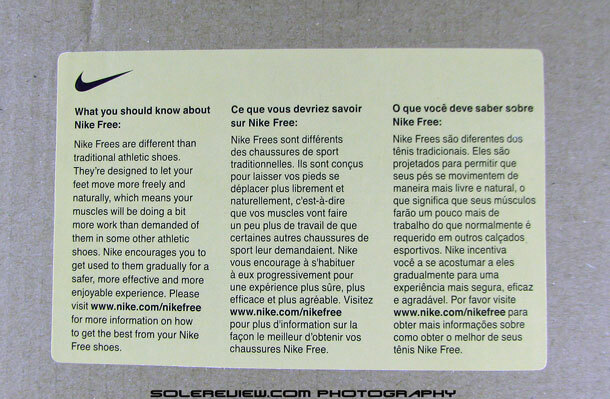 Nike Frees tend to cause some soreness along the calves in some cases, but pain is not normal. A few days after i started running with these shoes. Have never had pain in my calves up until now. Feel great for the first mile but then the pain gets worse and worse. I wake up with sore calves everyday now. And also I have normal feet. If this has been going on for a while, then it might be a good idea to stop using the Free. Usually the soreness disappears after resting+stretching for a few days. Are you running competitive XC? In that case your coach might be able to help better. It seems that the Free’s aren’t working for you, would be a good idea to switch back to something traditional. Can’t say for sure which model, will be better to ask your physio or coach. Well our work out usually includes hilly dirt roads and on road for 3 to 4 miles. I did notice something weird and uncomfortable when i walk on the road with the 4.0. My friend has the same type of shoes but he says he doesnt experience the same pain when running. Shoes react in different ways for runners, so can’t say for sure what the exact problem (or solution) is. It’s better to see someone who can help. I run in Flex too. Experience RN2, to be more exact. In fact, until this moment I thought that it was something like Nike Free. And now it turns out that there is a big difference between them. Now I wonder what kind of shoes I have and what they are intended for. Are Nike Flex created for barefoot-like running? Are Flex OK for fast intervals? Should heel-striker avoid using these shoes? a) No, the Flex Run is closer to a traditional running shoe. Even the Free’s are not close to barefoot running, they have substantial midsole stack heights and cushioning levels. b) You can do fast intervals in the Flex, but there are better shoes for that. Nike Zoom Streak 5 and Streak LT, adidas Adios and Boston Boost and Brooks Pureconnect come to mind. c) No reason for heel strikers to avoid Flex Runs. Your running form matters more when it comes to injury free running. You’re better off with something like the Nike Air Pegasus 31, which is more comfortable and durable. I’ve just found your website and am really impressed by the degree of detail and expertise in your reviews! I’m running in the Tokyo Marathon next February. I bought a pair of Nike Free Flyknit 4.0 about two months ago and overall like the shoe, although I suffered an ankle strain and had to take three weeks off training. It’s going to be my first Marathon, but I’ve been running for about two years, usually 5-6k three times a week. (My best 5k is 18:47). When I bought this shoe, the shop staff member said this is not a marathon shoe. What do you think? Can one run a marathon in this shoe? Thanks! Lucky you, getting to run in one of the amazing cities in the world. The course is mostly urban, though the finish is in picturesque Odaiba, where there’s a lot to do once the race is over. You could run the marathon in the Free 4.0, but the soggy/flexible frontend will make it too much work. In your place, we’d switch to something like the Nike Zoom Streak 5 which provides better toe offs. By the way, a 18.47 5K is fairly good pace, and the Streak 5 might help your cause. Your call though. Thank you very much for the answer! I’ll consider the Zoom Streak 5, although I’m more inclined to try one of the adidas Boost shoes. The Energy Boost 2 (pre-ESM version) is now on sale for around $75 in Japan because the ESM is already out. Do you think this is a good deal? (What is ESM anyway?) And where would you place the adios adizero Boost 2 compared with these shoes? $75 is a great deal for the Energy Boost 2 Techfit. That shoe is generously cushioned in the heel, with a super snug upper. The ESM (Engineered Stretch Mesh) version has a slightly more breathable upper, but essentially very much the same shoe. The Adios Boost 2 is more of a race day shoe, with a very thin forefoot and dialled-down cushioning in the back. We liked the Adios Boost, except that the midsole portion under-arch tends to poke in a few miles into a run. You might also want to consider the Supernova Glide 6 Boost if you’re in a mind for more cushioning than the Zoom Streak. The Glide Boost sits somewhere in between the Energy Boost and Adios. Thank you very much! By the way, the combination of the quality of your reviews with responsiveness on the comment board is hard to beat. Please keep it up! Hi there, I just wanted to clarify your points made around size/fit … first time I’ll be getting to try Nike’s Flyknit upper! So the F4.0 runs ‘true to size’ but has a longer and wider toe box than normal (2/3rds longer)? I assume this means to expect more than a thumb’s width space at the front of the shoe? Do you recommend sizing down? I’m thinking about these for casual/gym use. I’m a 12 in the ZE7 and a 12.5 in the Boston Boost. Yes, we would half size down to 11.5 for casual/gym use. The insole length is true to size, but the elastic heel helps the foot sit a bit towards the back, opening up space in the front. Like you said, around a thumb’s width. That said, your foot anatomy might be different leading to a opinion contrary to ours, so the best thing is to try them if you can. Also try them on barefoot, because you wear these w/o socks, and they still feel comfortable. Hi, I have flat foot. Is it ok to run with Free Flyknit 3.0? Am using LunarGlide 6 for long distance but felt that the Free can be faster. Can’t say for sure, you’d need to do a few long runs in them to be certain. Hi, I play floor hockey, which involves a lot of stopping and starting and quick side-to-side shifts from foot to foot. Do you think the elastic collar around the ankles provide enough support for this type of activity? I’m guessing I should be looking at a shoe with a more rigid collar area. Hi – what is the surface you play on? Collar area doesn’t help so much with stability as much as the sole does. It’s like the high ankle vs. low ankle thing in Basketball shoes, higher collars does not improve stability or rolling. I play on a basketball court, which is the laminated wood. I’m just worried about rolling my ankle when making a sudden stop. Would this shoe be fine for this surface? We think that the Nike Free 4.0 Flyknit will be highly unsuitable for floor hockey. The upper fit isn’t sorted for the kind of lateral movement, sudden stops/turns, and there isn’t enough protection near the toe areas. Hi would these shoes be good for running on the road? Usually run about 5km – 10km? And also how long would you expect these shoes to last if you wore them a few times a week? Hi so i am thinking of joining my high school team’s cross country team. I ran cross country in jr high and want to continue into high school. I don’t know much about how much they run or where they run, but most of my older friends say they run about 3-5 miles on the street or sidewalk. Are these Nike flyknits a good choice for me to buy for a girls cross country team? Also, I was wondering about the sizing. I plan on wearing these shoes with thin socks, and my feet are a little under 23 cm which is the women’s shoe size for a 6. I’m debating whether to buy the size 6 or 6.5 if I plan on wearing socks. These shoes look tighter than normal shoes, and since they are made to feel like a sock, should I order half a size up into a 6.5? Thanks!! a) The deep grooves tend to trap debris when you run off-road. b) Outsole lacks bite on slightly damp surfaces, like grass with dew on them. Don’t think there’s a need to upsize. The elastic heel results in the foot sitting a bit towards the back, and opens up some room in the front. Size 6 should be ok. Instead of the Free 4.0, try a shoe like the Nike Pegasus 31. Hey I know this is from a couple of months ago, but I need help. I am only 12, and have been running CX for 2 years. My first cross country year, I ran in Adidas Climacools. Last year I decided to try the Nike Free 5.0. They worked great, considering the type of workouts I did. Mostly of flat terrain, i.e. grass, road. Since, I am only 12, and I do not have a consistent money income, I was wondering if the Free 4.0 would be a good investment. If not the F4.0, then do you have any suggestions on any other shoe? Thanks a million. It might just be a good idea to buy the Free 5.0 again. The new model is around the corner, and deep discounts are available on the existing 5.0 model. Wouldn’t recommend the 4.0 for three reasons. First, the upper pores are larger than 5.0, which means running cross will let in more debris. Two, the forefoot is slightly looser so will not match the fit experience of 5.0 when it comes to lockdown. Thirdly, it is $20 more expensive without appearing to offer no additional benefits (in your case) over the 5.0. Hey solereview, I need some help, I just getting started to run more, I’ve been running with the Lunarglide 4 and it felt great, but quite “roomy” in the toes area. I’m considering to buy the Free Flyknit 4.0 because I’ve heard great things about it and it is also on sale. So the question is, should I make the switch? Hi Hoang, wish you a happy new year! The Nike Free 4.0 tends to run slightly larger because the flexible heel tends to have the foot sit slightly backwards. Based on our experience, we would recommend buying half a size smaller in the Free (US 11.5) compared to LG. However, it is advised that you try them for yourself first as foot anatomy might differ from runner to runner. For all you know, you might be ok with the same US 12 size. Otherwise the Free 4.0 FK is a great shoe. The only thing to watch out for is the extreme flexibility compared to Lunarglide, and the lower heel to toe drop. This might create initial soreness (or not) depending on your physical conditioning. 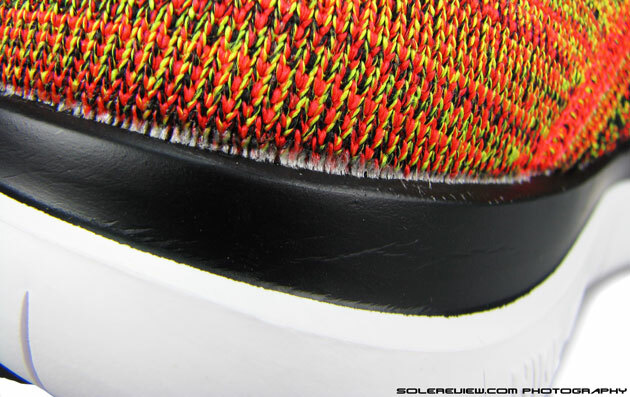 Hi – the Pure Boost’s tongue needs to be broken in, as the edges are rather hard. It might just be a good idea to stick to the Boost rather than 4.0, which is not as comfortable as the adidas. For walking/standing, we do have our favorites like the Pegasus 31. And if you can score a pair of Nike Prestos (OG design) off ebay, nothing like it! What is the exact model name and year of the Free +2 you mentioned? The Pegasus 31 and Free Run 2 are very different shoes. Pegasus is softer in heel and forefoot, but lacks the forefoot flexibility of Free. The Free 4.0 has a thinner outsole (including forefoot) than 5.0, and hence more flexible, yet at the cost of cushioning. The upper is super comfortable and roomy though. Hi I need some advice too! 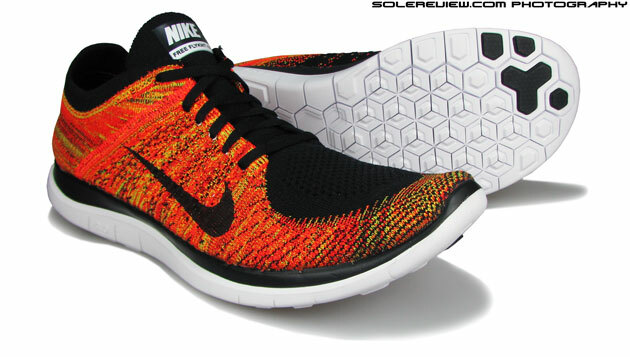 Im planning to buy a new pair of running shoes and Im pretty much set on these flyknit frees. However I also realise there are other models such as Lunar 2, which are supposedly good running shoes too. I don’t run alot actually just casually like once or twice a week 5km ish which pair of shoes would you reccomend? If you’re not running much, the Nike Free 4.0 Flyknits are the way to go. They look rad, and come with very comfortable uppers. I’m torn between the 3.0 Flyknit and the 4.0 flyknit. I’m a neutral runner with a mid-forefoot strike. I’m use to running in “minimilist” type shoes (VFF, Brooks Pureflow, etc). I run 25-30 miles/week. What would you suggest for someone like me? and I know I’m a 10.5 in the 4.0, would my size be different for the 3.0? Have you tried the 3.0 Flyknit at the store yet? Those fit aggressively tight – and literally snap fit on the foot. Has great ground feedback because of that (and the lower profile midsole). If you like the sound of that, then the 3.0’s for you. In our experience, the 4.0 is a half size larger, so if you were ok with 10.5 in them, then you’d need to go 11 in 3.0. But it depends from person to person, so try them on first before buying! The 4.0 is much more relaxed – forefoot is pretty roomy, and there’s no compression fit of the 3.0. But if you liked running in VFF and PF’s, then we have a feeling you’d lean towards the 3.0 Flyknit. I’ve been using a pair of Pegasus 29 for a year now. Running about 27-30km/week on concrete in the city, and think of “upgrading” to a more barebones runner. Although I have a pair of old Free 4.0 I don’t use them for running, since my feet hurt after a few days. Min you, it was back then when I started to run regularly, thus lacked training. Torn between Flyknit Free 4.0, and the latest Pegasus 31 now. Any thoughts from your part? Thanks for your time. The Pegasus 29 to a Free 4.0 Flyknit is a pretty drastic transition. Not certain what your level of physical conditioning is, but a safer bet would be the Peg 31. Thanks for your quick reply. Well, I’m in quite good shape for a non-athlete. I run 3-4 times a week, and work my musculoskeletal system on the days when I’m not running. I weigh 78kg at 192cm, <9% body fat. The Peg 29 offer too much cushioning for my taste by now. I think I'd really like the 31, no doubt about that, but also read a lot about how ones running benefits from minimalistic shoes, when joints, and ligaments are up to it. Do you think the transition is too drastic, and I should maybe get the 31, use them for a year, and go minimalistic then? Problem with Nike though is, that you never know what next version they come up with- and they seem to have a real winner with last year's 4.0 Flyknits. In that case, you could try the Flyknit out. Slowly start weaving the shoe into your rotation and build up miles gradually. The 4.0 is far from being ultra-minimal, like Vibrams or even racing flats, so it isn’t an extreme example of minimalist construction. Still, one needs to maintain caution. During your workouts, spend more time on calf raises (regular and reverse), shins, Achilles and plantar stretches. This should help smoother transition into lower drop (and ultra flexible) shoes. Thank you very much for your expertise, and help. I went with the 31 in the end. Got a great deal on a shopkeeper because it was yellow (which I actually prefer for visibility in autumn, and winter), which made it a no-brainer. Turns out my arch is way too high for the Free 4.0s. Would’ve needed a size that as a consequence left too much space in the toe box. Thanks again! Can’t wait to take them for a spin tomorrow morning! Great! Let us know it goes for you. Sorry for the delayed response. Well, both shoes are good in their own way. With the Free, you get a minimal footwear experience (breathable/lightweight/flexible/low heel drop) vs. a built up shoe like the Structure 18. If you can lay out your running shoe needs in detail, that would help. Better still, a few examples of shoes which you’ve liked before. That could be a good frame of reference. Hi, should I buy flyknits free run or should I buy free run 5.0? I run a lot. Our personal favorite would be the Free Flyknit 4.0. It has the stretch Flyknit without the extra compression, and is overall more comfortable than the 5.0. The 5.0 has a little more cushioning than 4.0 FL. I have spent the last couple years running in the New Balance Minimus, and have looked at getting these. My main concern is the durability of the outsole- the NB’s have a Vibram outsole, which has held up remarkably well. I run strictly on pavement and do half marathons, would these work well for me or should I be looking at a different shoe? One other shoe I was looking at was the Nike FS lite run 2, but I can’t seem to find much info on it. From an outsole durability standpoint, Nike Free goes around 300 miles without any issues. We haven’t tried the FS Lite Run, so can’t offer an opinion there. What kind of mileage do you get from the NB’s? Hi! I’m training for a marathon (12 weeks away) and need a new training shoe. I currently train in these flyknit 4.0’s and love the feel of them but my knees are starting to feel a bit clicky after I started increasing my milage per week. I’m wondering if I need some more cushioning as I heel strike? I normally do 3-4 10kms a week and a 20km+ on the weekends, mostly on pavement. I’m 23 years old, 5ft 10 around 145lbs with a normal arch. I tested a pair of 3.0 flyknits in a running shop and found I was perfectly neutral in them. Would you advise going for a pair of free 5.0’s, flyknit 5.0’s or the Pegasus 31? Thanks! Do you include lower body strengthening and conditioning exercises in your routine? if so, what kind? The graph on the FOB and Retail price is interesting. While the information you have on the cost structure might have correctly led you to the inference that ‘Nike is more efficient in minimizing cost’ it is also possible that the manufacturing costs are difference on account of the different material that go in to the shoes of different manufacturers and the differences in cost and retail price actually indicate the margins across brands and models of the same brand. By the way, FOB means Free on Board. a) Agree with the difference in materials is one of the reasons how Nike manages pricing efficiency. b) Larger gap between revenue and cost of revenue indicate higher margins, that is a given. c) Free on board and Freight on board are synonymous. FOB may be called either of both. Howdy! I’m a relatively new runner. I have been running for about two months and usually run three times a week, 2 miles per run. I am a heavier runner, although I have been losing weight fairly quickly. I currently run in the Adidas Response Boost Techfit. I am a slight under-pronator with a deliberate midfoot strike and these shoes do not work for me. The stability control hurts the outside edge of my feet. I am looking for a more neutral shoe and want a minimalist type, but not too agressive at this point. I tried the Flyknit 4.0 on at a local retailer, but they only had one pair in stock and it was an 11.5 men’s. I generally wear a 9.5, but even with the shoe being too large, it felt great. In your opinion, would the 4.0 be a good choice for me? Would the 9.5 be okay, or should I go up a half size. Thanks for your input and guidance. Hi! Based on your requirements, the Free Flyknit 4.0 is a good option. Also see/try shoes like the Saucony Kinvara 4, Skechers GoRun 4 and GoRun Ride 4. You should do well by sticking to your regular size (9.5). Hi-find your reviews great and very detailed. I’m pretty much set on the Flyknit (either 4.0 or 3.0), and will definitely try for running. Now I’m planning to do a 25 day hike, mostly on flat but dirtroad surface. My problem is that any hiking shoe I tried so far gives me terrible blisters after a day, so the sock-like upper sounds great for my needs. However, your point on the no-traction and pebbles in the sole makes it look like the Flyknit would not be good for this purpose (walking about 40 kms for 20 days straight, mostly on paths, but little elevation). What do you think? Is there any other shoe with this kind of upper sock-like grip that seems would not hurt feet much but with better fit on the sole for hiking? Thank you! How about the Flyknit Lunar 2 (or 3) or Under Armour Speedform Gemini? Both have compressive uppers (more on Gemini), but with added cushioning. Not meant for trails, but make for a better case than hiking shoes given your needs. Try both of them at the store, and see what feels better. Thanks a lot! In fact was looking at Underarmour Speedform XC (women), I think Gemini is ony for men? Is there a Flyknit model for women with better traction (I think Lunar is men) – sorry should have specified I’m a woman. Thanks! The Gemini is available in both gender (colors), so that’s an option for you. 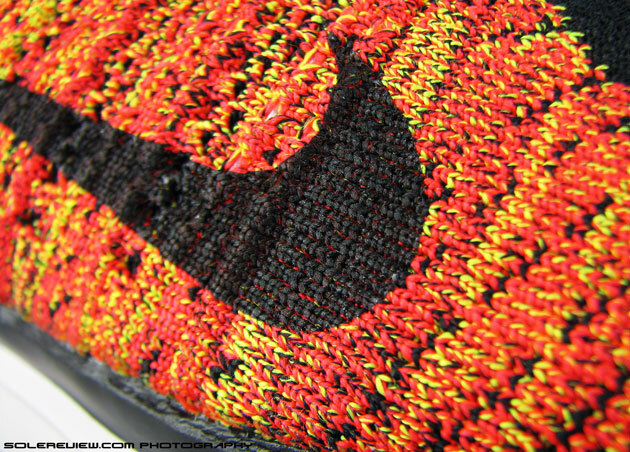 Likewise for the Flyknit Lunar 3 – Nike also makes women’s colorways, so both shoes are something you can look at! Should i buy 4.0 or 5.0?Which is better? My current shoe is the Nike Free 3.0 v5 which I love but are wearing down…which shoe in the current Nike Free lineup is most comparable? Mostly used for lifting at the gym, with a little bit of running but not putting serious miles in. I also have the 5.0 Flyknit from a few years ago, but preferred the feel of the 3.0 v5 shoes. The Nike Free 4.0 Flyknit reviewed above compares well with the older Free 3.0. Hmm if you had the choice to buy the 5.0 or the flyknit which would be better if you have wide feet and youre just looking for an everyday shoe? As of now, the 4.0 Flyknit. But we might have a different opinion once we review the 2015 editions of the 5.0 and 4.0. Any ETA on a review for the 2015 version of this shoe? Mid -May would be a good time to check back again. I am curious about this shoe’s fit and feel versus the Free 5.0. I have been running in Free 5.0 for 2.5 years and they’ve done wonders for my feet, eliminating my plantar fasciitis, I believe due to the flexibility forcing my foot to work as it was intended. I hate having to size up though given their narrow toe box and the 2015 version seems to fit the same. I feel the extra space up front takes away from the spring off from the toe. If these are truly wider in the toe box they might be the shoe for me but I’m concerned that I’d be giving up too much cushion. Any thoughts on how different the cushioning is? 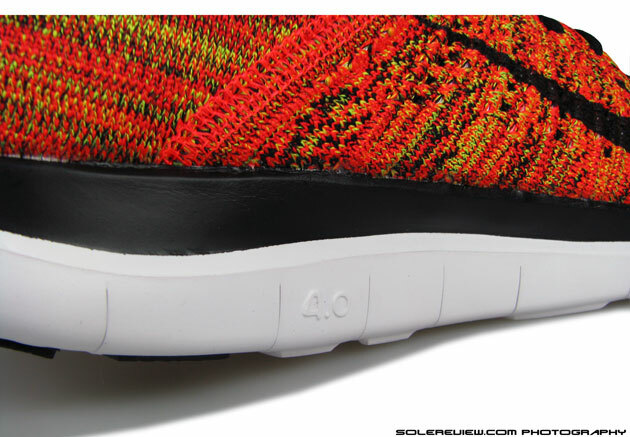 The 2014 Free 4.0 Flyknit is not wider than the 5.0. While it feels more relaxed compared to the original Flyknit and the 3.0, the 5.0 is a much spacious shoe in the forefoot. You’re correct, the 2015 Free 5.0 fits similar but based on first impression, we felt the 2014 model to have a more accomodating forefoot – the 2015 feels snugger on the lateral side. The 5.0 is more cushioned than the 4.0. There are a couple of reasons. The heel stack is thicker on the 5.0; in addition the foot sits a bit behind on the 4.0, which means landings happen on the tapered part of the outsole. I have only tried Nike Free 4.0 a few times. After few minutes of my running session, toes start to tingle. Is it possible that this occurs because I bought shoes one number larger than usual (because I have high instep)? Do you have any solutions or you think I will get used to it? How is the fit in the front? Tight or loose? Don’t know. Nike has not published it, and we haven’t measured it. I am a bit disappointed with the Flyknit 4.0 sole. In just a month of use the shoe sole gives sound like the suction pads while walking. Also i notice the sole in the heel section have developed some gap which could be the reason for the sound. Please advise how to get rid of this sound. Haven’t encountered that issue before. Don’t think can help, but curious to know what surface you use the Free on? I am after a new running shoe that fells similar to my footy boots (low to the ground, flexible and not quite so cushiony) that I can train in for football umpiring. At training we run anywhere from 1-7km in an hour with breaks in between, at changing paces (on grass as well as paved areas). On game day, switching from really cushiony sneakers into my boots makes my feet feel like there is no cushion in my boots whatsoever (it literally feels like running on a piece of cardboard). Would you recommend these shoes for this purpose, or would you recommend a different shoe? P.S Thankyou for such a comprehensive review!! While the Nike Free 4.0 can be used given your needs, we think that the Brooks PureConnect 4 is a good option. It’s podular outsole somewhat mimics the pressure points used on cleated football boots, and the smooth forefoot with minimal layers helps in better ball feel for the occasional contact. Good for all surface too, ranging from firm ground to soft. The Skechers GoMeb Speed 3 also deserves a noteworthy mention. But if your training happens to be on grass, have you tried the TF outsole versions of your footy boots? 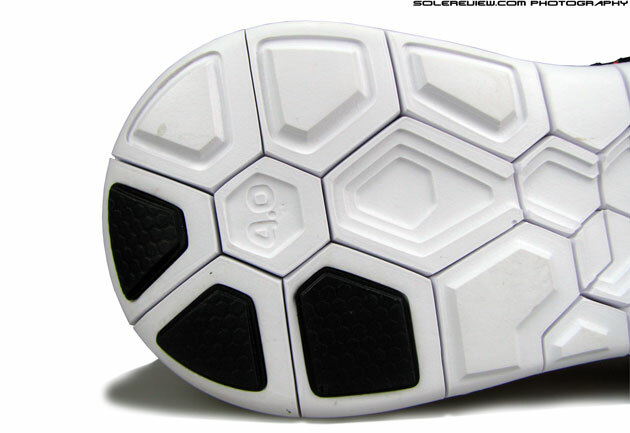 They are usually sold by most brands, with football uppers but with EVA midsoles and rubber outsoles. I’m wondering about the exact size to go in these. In a regular shoe I am a size 6. I tried on the Free 5.0 yesterday and the size 6.5 was a good fit. I have narrow feet and am only intending to use the 4.0 for walking and everyday wear. Would you recommend I go up to a size 6.5 or stick with a 6? There is no where here for me to try them on. Hi, this is a great review. I’ve been using the 2013 Nike Flyknit Free 5.0s that I picked up for a nice discount since last year. I had to go a half size up from my true size to fit into those shoes but I was having the dreaded 1st generation Nike Flyknit Free problems with the suffocating collar and pinky-toe squeezing fore foot. But I survived wearing it all this time for only a couple hours at a time each wear. My question was about the sizing. I went a half size up from my true size for the 2013 Flyknit Free 5.0 and I was wondering what size would be best for the 4.0? You mentioned that the 2013 5.0, which I wore a size 12 in, ran 2/3 a size larger than these new 4.0? I know I’d fit into an 11.5 but do you think I’d be able to fit in the size 11? You mentioned that there was some extra room in the forefoot and also that there was space between the front of the shoe and your toes. The reason why I’m pondering the size 11 is because I like my shoes to fit perfectly and I know trying these on in person would be my best bet but I wanted to know what you’d advise if I wasn’t able to try them on in person. Thank you! Hi George, if you were a size 12 in the 2013 Nike Free 5.0 Flyknit, a size 11.5 should do it for you in the 4.0 Flyknit, as the front fits half a size larger than the FF 5.0. The only catch is that 4.0 is still snug around the pinky toe even in the same size as Free 5.0 Flyknit (with half a size of space ahead), so wouldn’t advise a full size down. Hi there, me again. Been training a lot to run in flats, and minimals and can run quite comfortably in my Streak LT2 and NewBalance MR00v2. My mileage is 30-35km/w but I wanna ramp it up to 50-60km/w. I hesitate a bit though to use those hard shoes as daily milers, and would appreciate your take on this: Should I switch to something more cushioned yet light, like the Streak5 or Flyknit Racer? Or in this case, is the Flyknit 4.0 a good shoe for daily distance runs with a weekly long run of say 20km? Also, the 4.0 is quite expensive in Europe and doesn’t look to hold for a couple of hundred km, right? Instead of the Free 4.0 Flyknit (which is a great shoe, by the way), why don’t you consider the Lunar Tempo? Incredibly lightweight and well cushioned. The pricing is sweet too. Thanks for your reply. I will consider the Tempo as my next shoe. I’ve been reluctant so far because I don’t like the looks of the whole Lunar series. In the meantime I got a pair of Hitogami 2s in a clearance sale for 50€ which was too good an occasion to pass up. Looking forward to giving Mizunos a try. Good to hear that! Did not recommend the Hitogami as the ride is pretty firm. Will continue this conversation under the Hitogami’s review, more fitting I guess (pun intended!). Is this for men or women ? This is the Men’s version, but Women’s colors are available online. hi, I’d like to know if these shoes are suitable for people with flat feet? Hard to generalize, depends on what people are used to. I have size 14 flat feet and run in these. I’m about 190 pounds and 6’3″. No problems at all. I have also run in the Free 5.0 2013 model with less injuries than when I wore “traditional” trainers. You might have to work up to longer runs if you try these, but if you’re patient, you’ll probably never go back to bulky trainers.